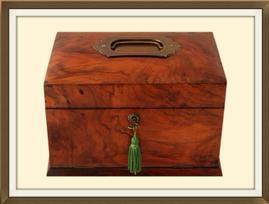 This is a truly beautiful antique jewellery box, complete with its original working lock and key. 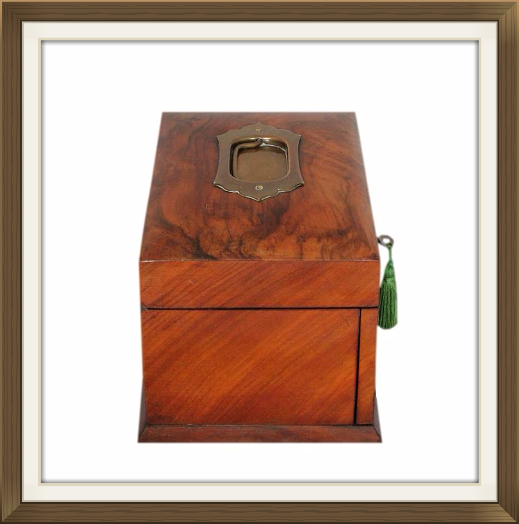 This box has a wonderful Walnut veneer and its original solid brass handle on the lid. The Walnut has a stunning high polished finish which has given it a gorgeous glossy sheen, and the handle has a large and extremely decorative, solid brass surround! 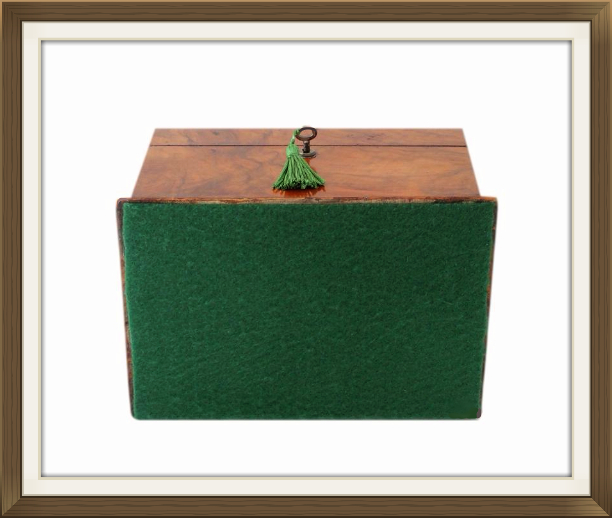 The lid has a lovely, gently domed form, and the base of the box has a stylish angular plinth. 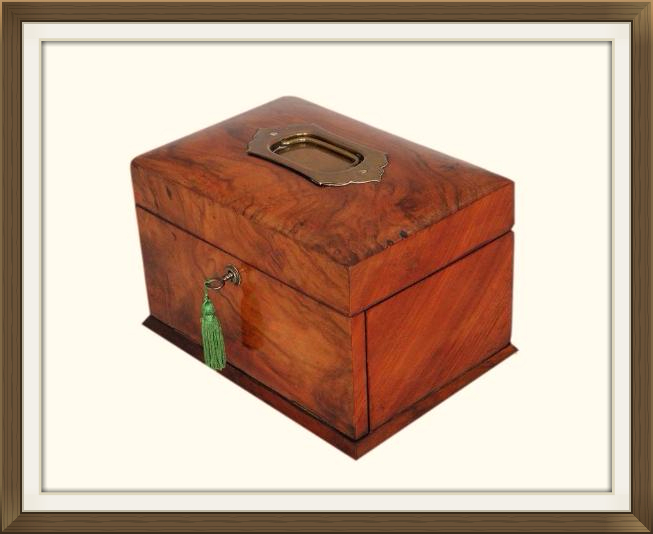 The box is complete with its original working lock and key, and also its original strong stop hinges. These prevent the lid from falling right back. The bottom of the box has a new green felt covering, added to replace its worn original. This will protect the surfaces of your furniture. The interior has a beautiful fixed tray and also boasts a wonderful deep and roomy drawer! These are both original to the box and are still in amazing fine condition! The tray has several storage compartments plus two ring storage sections. 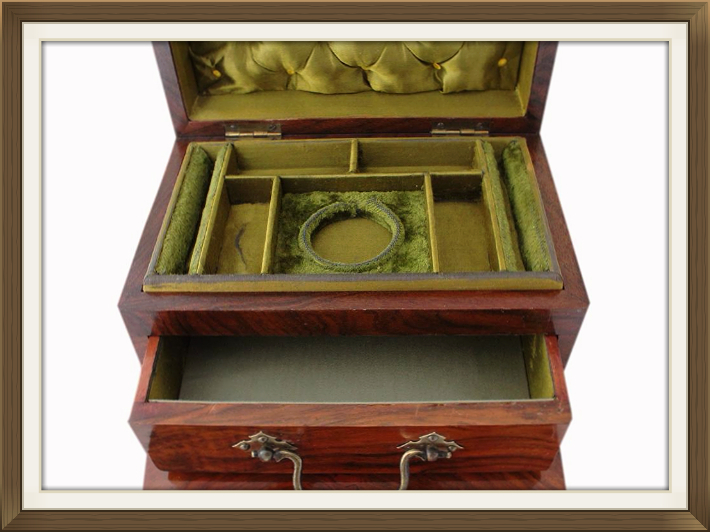 The centre front compartment has an inset tray with a circular centre that was originally designed for holding a pocket watch. This would now make beautiful storage for a large pendant or locket. The four little narrow compartments around this are an ideal size for small pieces of jewellery such as earrings, brooches and pendants etc. The drawer has a single deep and roomy compartment. This will hold your larger pieces of jewellery such as bangles, beads and watches. It has wonderful dovetail joints and a solid brass swing handle with very decorative fitments! The handle is a replacement but is a true antique from the Victorian period. It therefore suits the box extremely well. 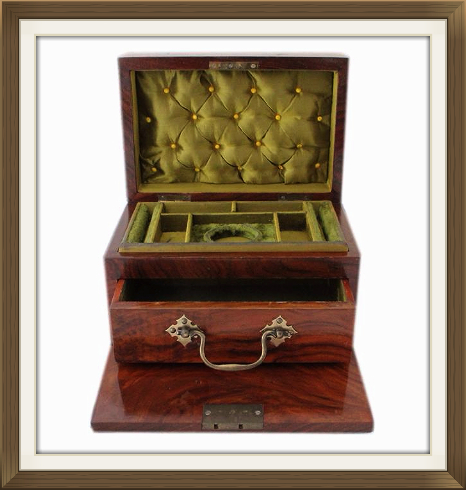 The compartments have their original teal green satin linings, and their original velvet coverings to the ring storage sections and the inset tray to the centre front compartment. The drawer compartment has its original teal green satin linings to the walls, and a new padded satin panel to its base. This is a replacement and is in keeping with the original worn panel. The new panel and the replacement period handle, have been added by our wonderful skilled box restorer. The inside of the lid has its original padded panel which is absolutely stunning! This has a luxurious quilted design and is beautifully detailed with deep buttoning! It is a very attractive feature of the box. 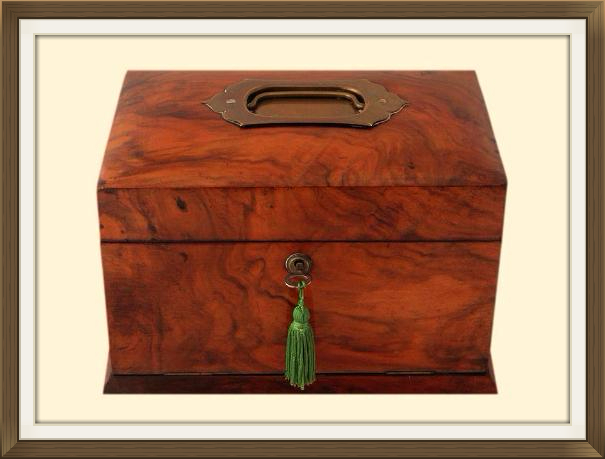 This wonderful box is in excellent condition for its 150 plus years of age. The veneer is still in wonderful condition. There are a few little nibbles here and there, along the bottom edges/corners of the plinthed base. Other than this it has some minor light surface wear/a few fine light scratches. None of this is in anyway unsightly and is the wear we'd expect on a true antique box which has been loved and used for its purpose! The interior linings are also in excellent condition. There is minor wear to the satin in the front left narrow compartment, and a minor fine pen mark to the satin on the rear wall of the drawer. The box locks securely but sometimes requires a little fiddling with the key to lock/unlock it. Length: 20.8cm (22.3cm across plinthed base). Width: 14.2cm (15.7cm across plinthed base). 7.3 by 6.7cm with a 4.0cm diameter to the circular centre. 6.5 by 2.7cm with a 1.8cm depth. 6.5 by 2.5cm with a 1.8cm depth. 9.8cm length. Each hold approx 5 rings. 17.6 by 9.4cm with a 4.0cm depth.